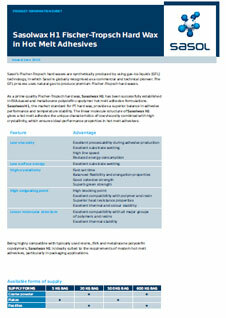 Sasolwax H1 by Sasol is a fully hydrogenated Fischer-Tropsch hard wax. It is available as coarse powder or pastilles. It is composed of hydrocarbon chains that are predominantly linear. It has high melting point, low viscosity, excellent hardness and has good heat stability. 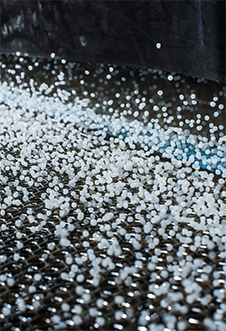 The linear molecule structure of Sasolwax H1 gives a hot melt adhesive the unique characteristics of low viscosity combined with high crystallinity, which ensures ideal performance properties in hot melt adhesives. 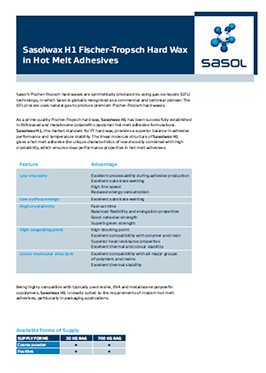 Being highly compatible with typically used resins, EVA and metallocene polyolefin copolymers, Sasolwax H1 is ideally suited to the requirements of modern hot melt adhesives, particularly in packaging applications. 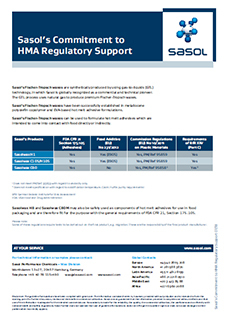 Sasolwax H1 complies with the following regulations: European specifications for food additives according to E905, FDA CFR 21, Commission Regulation (EU) No 10/2011 (Ref. 95859), Recommendation of the BfR (German Federal Institute for Risk Assessment) XXV, Part C.